“Paramount in Beecham's ENTFÜHRUNG is a sense of the theatre. He brings a lightness of touch to all, highlighting the comedic situations while retaining the deeper issues (oppression, treatment of women) at stake in the plot. Beecham was a great conductor, too, though. Listen to how he encourages his chorus (the Beecham Choral Society) to heights of celebration in the exultant Act 1 chorus, 'Singt dem grossen Bassa Lieder'. The sense of near-abandon is also heard in the faster sections of the overture and how Beecham relishes the 'Turkish' percussion! Of course, it is the Beecham sparkle that one looks out for, and nowhere is this more in evidence than in the Act 2 drinking duet 'Vivat Bacchus!' (Pedrillo and Osmin). The orchestral staccato is light as a feather. 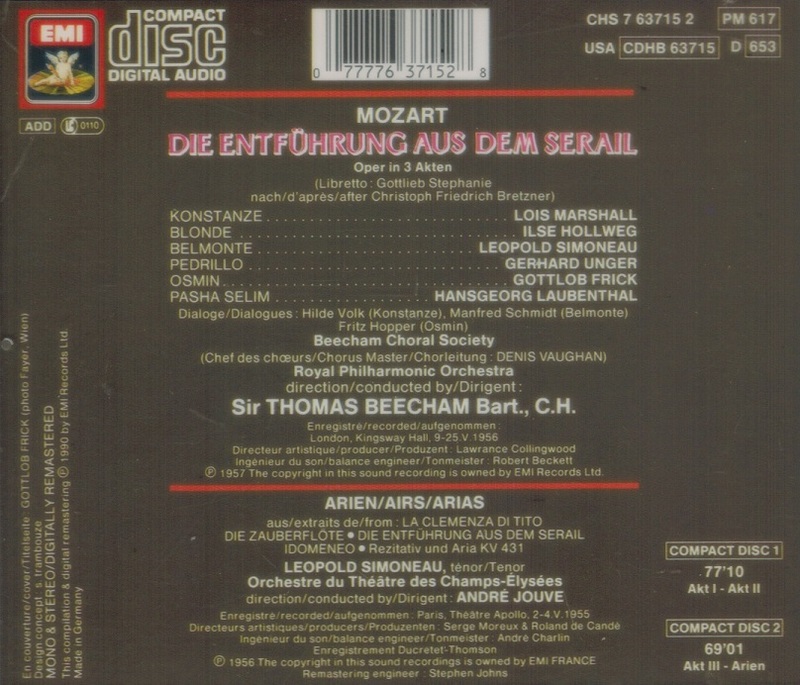 If Lois Marshall sounds a little tremulous in her Act 1 aria, 'Ach ich liebte', her Act 2 'Welche Wechsel … Traurigkeit' is infinitely touching. Ilse Hollweg shines in the other soprano part, Blonde. Her security up high and purity of tone in 'Durch Zärtlichkeit' is awe-inspiring, as is her overall range. On the other end of the emotional scale lies her Act 2 'Welche Wonne', negotiated with enviable ease by Hollweg. Gerhard Unger has all the power for a successful opening of 'Frisch zum Kampfe!' and yet, when it comes to Act 3's 'In Mohrenland gefangen' he spins a legato line of the finest silk … and how delightful is the RPO strings' pizzicato accompaniment here! Gottlob Frick is the superb bass chosen for Osmin. He fully holds the extreme bass notes Mozart requires of him. 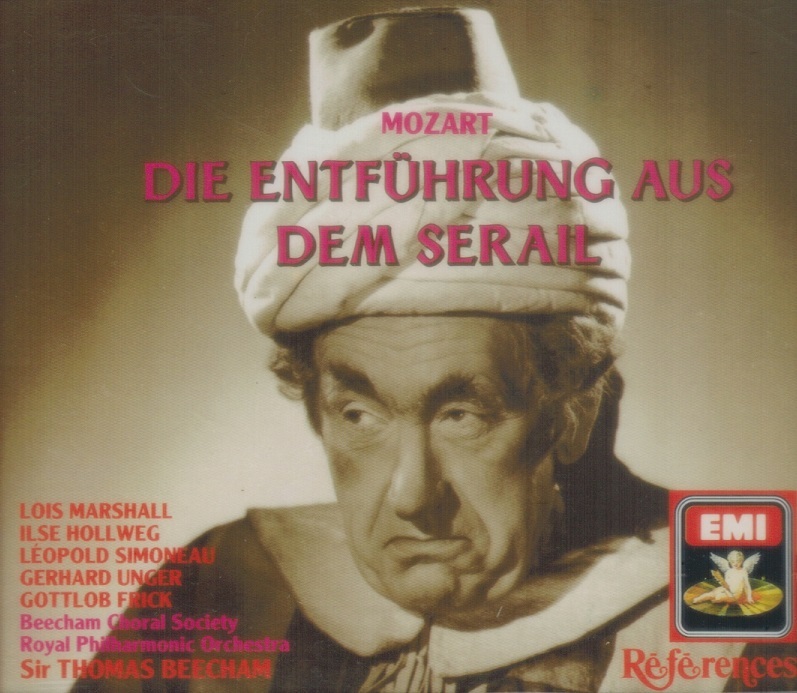 His Act 1 comedy is truly amusing, as is his sense of largesse in the later 'O, wie will ich triumphieren'. Simoneau shines brightly as a young sounding yet dignified Belmonte; 'O wie ängstlich' is truly superb. The sound for the bonus items is rather more harsh. It hails from Ducretet-Thomson rather than HMV originals. Thankfully this is something which affects the orchestra more than the voice. Simoneau's honeyed tenor is marvellously lyrical in the CLEMENZA excerpt, his voice stretching effortlessly to the highest notes. It is this ease with the higher end, plus the seamless legato, that make the ZAUBERFLÖTE excerpt a thing of such beauty.